Polymer Ribs - Bracker's Good Earth Clays Inc. The Red Very Soft polymer rib is excellent for finishing rims. The Yellow Soft polymer rib is excellent for smoothing. The Chartreuse Green Medium is excellent for smoothing forms. The Blue Hard polymer rib is excellent for throwing and shaping. 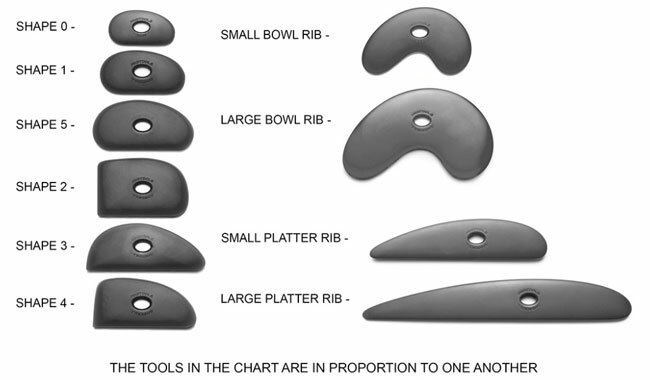 Whether you are throwing clay on the wheel, hand building or sculpting, the pottery rib is a classic and essential tool. Because it acts as an extension of the potters own hand, we believe it should function well and be a joy to use. Whatever you want to make, Sherrill Mudtools has got you covered.